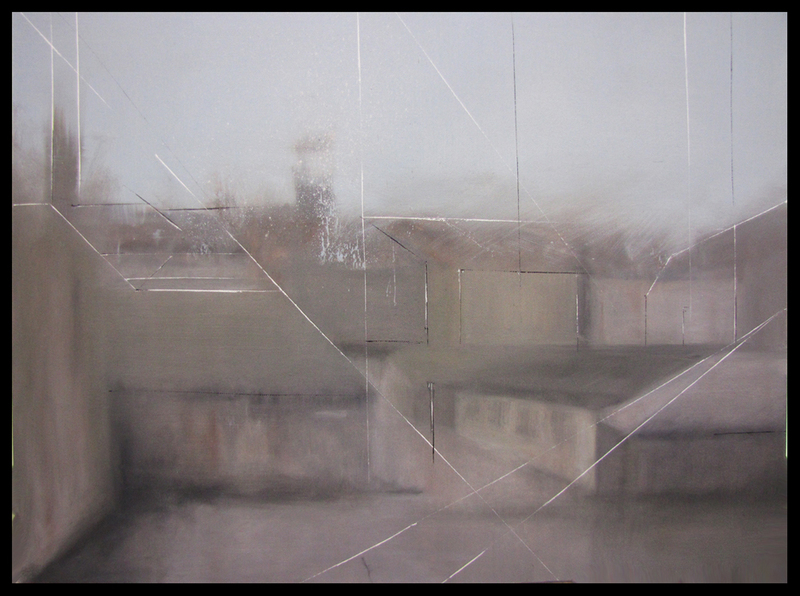 Art-el are delighted to introduce the latest body of work from the artist Dale VN Marshall. October 2010 heralded a breakthrough show of some proportion with the much acclaimed solo exhibition ‘Room 101’ which has set the bar in terms of VN’s relentless almost blind pursuit to make everything he touches a masterpiece. He’s the first to admit that painting 101 canvases in 101 days has left its mark, but in another way there’s been a distinct slowing of the pace (but no foot off of the gas) and a more mindful approach to his painting, with the letterform now almost dissolving completely whilst concept and context seems to have come to the fore. After facing so many demons in his last body of work the soothing process has seen him return to Cornwall, the heart of the rural South West to photograph and muse in the grounds of St Lawrence’s institution, where he spent some dark days after his sectioning. As a result the new body of work is intertwined with subtle nuances of imagery along with brushstrokes, line work and impasto, that on first glance is instantly more calm and calculated than the hectic and disturbing chaos that was so evident in his previous work. Perhaps more notably this will be his last collection in the UK for a while, as his third year of fine art study will be undertaken at the prestigious UCLA University in California after nomination from the arts faculty at Coventry University. This is obviously a very exciting move for Dale that will allow him to soak in the culture, so synonymous with that area of the world, especially the world of graffiti, which is intertwined in his background. 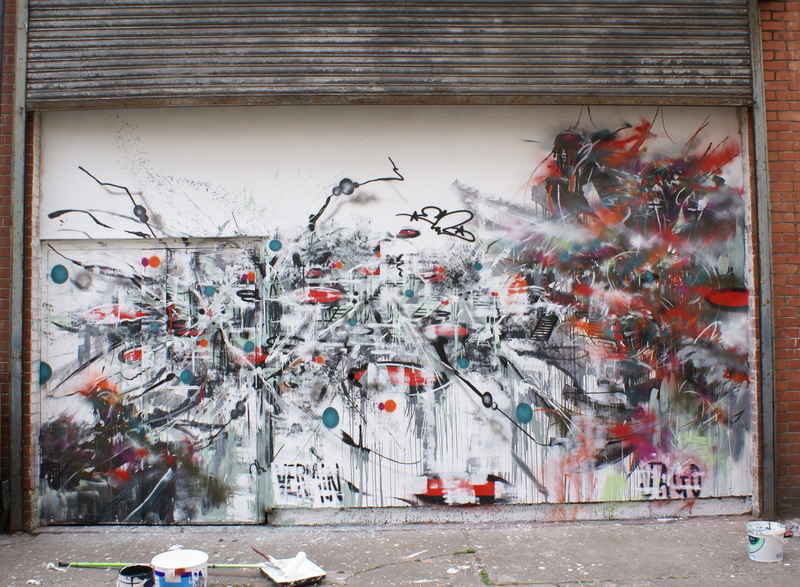 This will also allow Dale to prepare for his first solo US exhibition that will be held at the Anno Domini gallery in California in Spring 2012. This follows the sell-out of all nine of his canvases that featured in their prestigious Fresh Produce exhibition which took place at the turn of the year. Please click here for to preview the collection DPF Dale vn Marshall artwork pdf. The collection will be launched at 6.30pm (BST) on Tuesday 12th April at www.Art-el.co.uk. PLEASE NOTE: Sales will only be made on-line and there will be no pre-sales or work reserved. In 2010, there were 28 new posts, growing the total archive of this blog to 82 posts. There were 138 pictures uploaded, taking up a total of 266mb. That’s about 3 pictures per week. The busiest day of the year was January 5th with 109 views. The most popular post that day was I’m sure TOX has long commenced his ’10 bombing spree but we loved this. 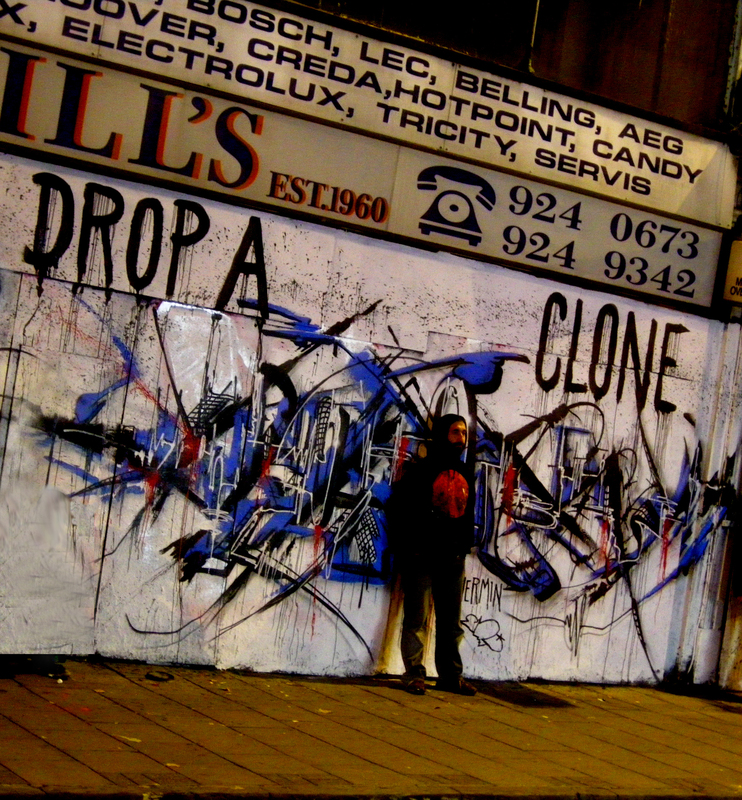 The top referring sites in 2010 were art-el.co.uk, facebook.com, banksyforum.proboards.com, en.wordpress.com, and jerforceone.wordpress.com. Some visitors came searching, mostly for mark ryden, belton, mercy centre logo, scooterman, and mr jago. Please check out the ‘VERMIN – ROOM 101’ pages where you can find lots of Room 101 insight. 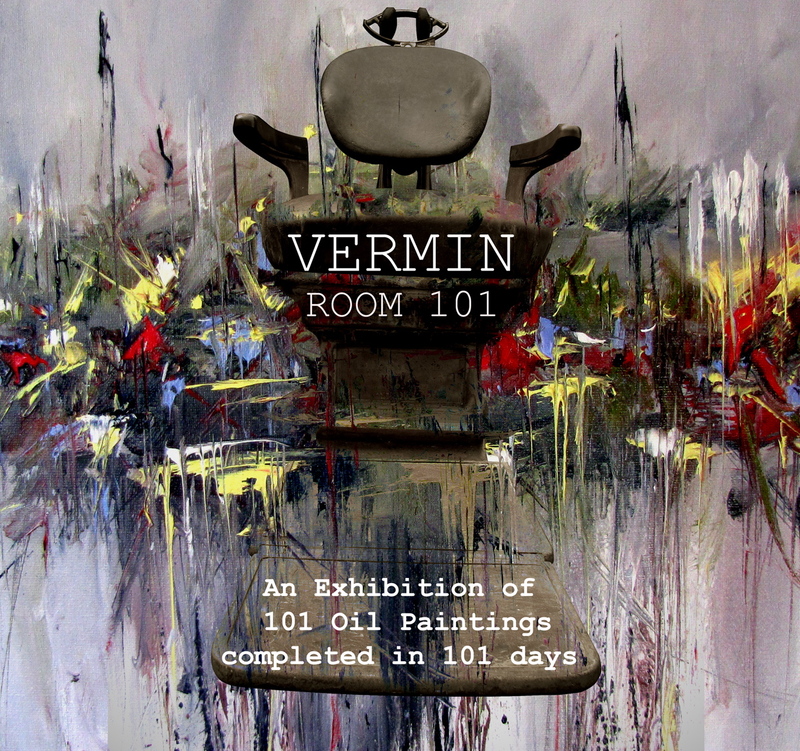 Room 101 will showcase 101 oil paintings completed in 101 days, (during the summer 2010), as well as five additional show paintings and site-specific installations, all deeply reflecting and exposing Vermin’s ongoing battles with the rigours and demands of mental health. The room 101 theme draws parallels from George Orwell’s novel, 1984, and the artist’s own personal experiences of being incarcerated in a mental institution in 1999. In total around 140 paintings were finally completed in the 101 days before the artist enforced his stringent quality control to tailor that down to the required number. All of the works in the exhibition will signal the artists salient diversion to the medium of oil on canvas, resulting in work with subtle backgrounds, impasto and consummate depth. Influenced by past masters and late 1800’s expressionism, yet mixed with Vermin’s highly recognisable piercing letter form and dirty graffiti aesthetic. Some are hectic, others more meditative. no doubt a reflection of the constant ebb and flow of a schizophrenic mind. Vermin’s oil paintings have already been lauded by members of the perceived graffiti establishment, as well as catching the eye of curators and collectors of contemporary fine art. His work is already owned by established collectors in the Far East, Europe, Australia and the US. 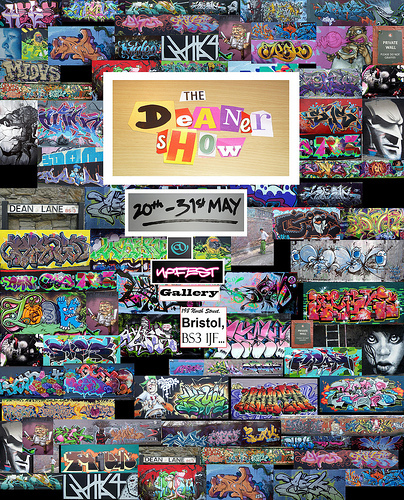 Mike Dring, Director of Art-el Gallery says, “Room 101 is a groundbreaking exhibition for Dale, an artist well-known in the South West aerosol/graffiti scene and beyond. This background has been the world that provided the foundation of his artistic outlet and schooling. It’s exciting that Dale has now chosen to take that in a totally unique direction by working in oils whilst studying at the renowned University of Art in Coventry. From a personal perspective it is also satisfying to see another member of the graffiti community making the graduation to Fine Art Graffuturism, following in the direction of a handful of others who have so successfully made the transition from city walls to abstract gallery work of the highest quality. I’m also delighted to announce that all of the canvases for Room 101 will be sold way under their true market value and priced at a Room 101 themed £101. Hopefully this will give collectors and fans of his work an entry-level to his canvases of which we will be releasing no more for the foreseeable future due to exhibition and commission commitments. All press, galleries, exhibition and work enquiries should be directed to Mike Dring, Art-el Gallery at all@art-el.co.uk. The show also has a dedicated Room 101 website at www.101010verm.in, where you can sign up for all show updates. The first time Mr Jago and Vermin have ever painted together. We hope it won’t be the last. 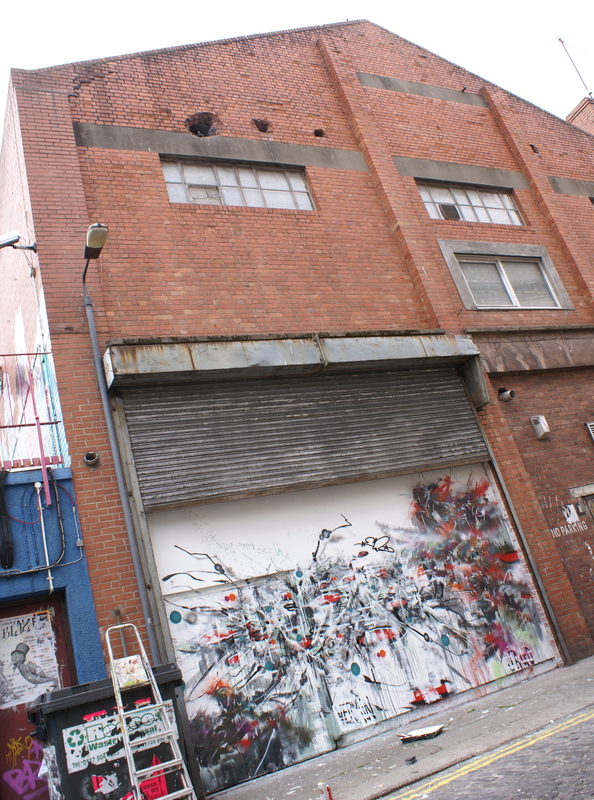 The piece is on the Blue Mountain Cub on Moon Street, check it out if you are out and about.